A few weeks ago we reviewed Andy Kirkpatrick's amazing book, Psychovertical. That piece humorously chronicles Kirkpatrick's obsession with climbing. 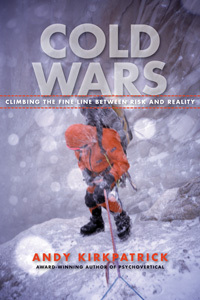 That first piece was so well-written that I quickly picked up Kirkpatrick's second book, Cold Wars. Kirkpatrick is married and has two children. The routes that he chooses are almost universally "high end" and are incredibly dangerous. He has a penchant for winter alpinism and for second ascents of serious lines. He aslo sometimes goes months without climbing. Cold Wars is a humorous and often tender book about the life of a climber and about what we give up to be in the mountains. Kirkpatrick regularly writes about the strange irony that many climbers feel. When they are at home, they can't wait to be away. But, when they are in the mountains, they wish they were home. We've all felt this way at one point or another. In the following passage we see this tension as Kirkpatrick pines over his young daughter while sitting before one of those incredible views at one of those incredible moments that only climbers in the high mountains get to experience. I switched on my phone, to see if I had any messages. It beeped. I showed it to Ian. 'Maybe you're falling out of love with climbing,' said Ian, switching off his headtorch to save the battery as the sky towards Chamonix turned red, and the rising sun lit up the spires of the Aiguilles, one by one. 'I really hope so,' I said. While this book appears to be more serious with a heavier question than the simplistic "why do you climb," it is still chalked full of Kirkpatrick's humorous climbing anecdotes. Indeed, as this book is structured more anecdotally than his first book, it could be argued that it is a funnier tome. Here is one great example of an experience the author had in the Alps shortly after losing a ski. Now I was really in trouble, as the snow was too deep to walk in, and skiing on a single board was beyond me. I took off my remaining ski and sat on it bum-shuffling down the slope, knowing full well that there had never been a more pathetic sight in the history of ski mountianeering. To make matters worse, a French guide swooshed down to me, looking like skiing's answer to Mikhail Baryshnikov, asking if I was alright. 'I'm British,' I said looking at the floor, trying hard not to burst into tears. 'I understand,' he said, no doubt embarrassed for me, and then skied off. Perhaps part of the reason I enjoy Kirkpatrick's writing so much is because I recognize myself in it. He is absolutely obsessed with climbing, as am I. He loves writing, but hates doing it, as do I. He has a family that keeps him grounded, as do I. And he lives in two worlds, the first is a world where he has a wife and two kids and they all live normal lives and do normal things. The second is a world where he "hangs it out," on high end alpine climbs and extreme big walls. I don't generally push the bounds of safety too far, but a few times a year I definitely push the limits. As a forty-two year-old mountain guide with a family, I really understand and appreciate his work. And I think that anybody who spends a lot of time on the sharp end and feels like they have something to lose will understand his writing too.